Please note that there are other examples of audio-visual or work-in-progress projects in the Members Page since they are not in the public domain. Please use the contact form to be enabled as a user and then navigate to the Members page. strawberry sauce – a straight 8 film by snapper films from straight eight on Vimeo. made for straight 8′s 2018 industry shootout on one cartridge of kodak vision3 200t super 8 film with only in-camera edits and no post-production. straight 8 is open to anyone at straight8.net. Breyers Delights – Dog from Klara Pierre on Vimeo. EVIL’S EVIL COUSIN [SHORT FILM] from Richard Peter Hunter on Vimeo. A short film written & directed by Richard Peter Hunter. The Sun – Sun Savers (director’s cut) from Richard Peter Hunter on Vimeo. ALIBABA from Jamie Maule-ffinch on Vimeo. Available from Broadbent & Dunn Ltd. 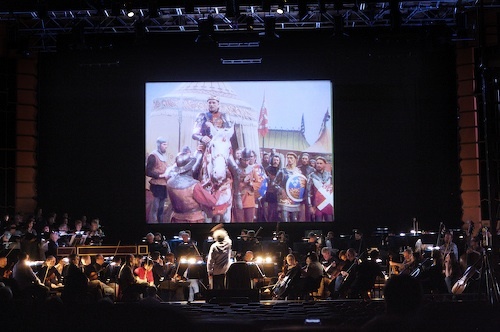 In 2006, I was approached by Gill Kay from the Brighton Festival to produce a live-music-to-film version of Walton’s score for Henry V (1944). A few months later and after increasing quantities of grey hair I produced a fully transcribed score of Walton’s original music for the Laurence Olivier film. The concert premiered at the Brighton Dome in May 2007 and was given by the RPO, the Brighton Festival Chorus and Youth Choir conducted by the fantastic Carl Davis. The sources for the transcription process consisted of all the extant Walton holographs from Yale University as well as the Christopher Palmer arranged Henry V – A Shakespeare Scenario and, the mono audio recording. Additionally, we tracked down a previously missing Walton manuscript which had been auctioned from the estate of an HB Vander Poel in London in the early 00′s and bought by Yale University. This crucial section was important musically as it was the culmination of the end of the famous Agincourt battle sequence. Although the holograph proved extremely useful the majority of the cue had to aurally transcribed with no references other than the original soundtrack. The Palmer version is an arrangement and although some care has been taken to remain faithful to the original, there are many alterations. The main changes in Palmer’s version were in the order of cues, the insertion of a piece of incidental music for the embarkation scene, the orchestration, which include numerous note errors and incorrect performance directions, as well as the lack of the significant end portion of the battle sequence. The transcription process was further complicated by the fact that originally the music was placed on the same audio track as the dialogue so erasing music during speech other than through some EQ was impossible. It made the transcription process very hard and time consuming and also proved problematic in performance. The entire film had to be re-timecoded and therefore, since originally the conductor had no click track, it includes numerous conducting tempo changes. In order to undertake this technical element of the transcription, two computers had to be used. The film had to run in real time on one computer so that, using Digitial Performer software, tempo changes could be inserted in order for a click track to be produced. The other machine ran Sibelius so that notation could be accurately written complete with bpm tempo changes. In addition, the film sound was muted on the film-playing computer so that an audio copy (without dialogue and at the correct frame rate) could be inserted at a specific timecode reference point and played in synch. Even at this stage there were further problems in actually being able to hear the Sibelius version. Since version 4 was being used I could use my EMU Virtuoso 2000 to produce all the sounds via MIDI. This enabled a score which contained a variety of staves each with separate doubling combinations (e.g. clarinet 3 played A, Bb and Bass Clarinets) so that a full orchestral score as well as conductor’s score could be produced. A vocal score with a piano reduction had to be produced as well (as I recall, in three days). Other difficulties were present in the choral segments – the words in the embarkation sequence were hard to make out but I discovered that Walton had used verse 3 of the Veni Sancte Spiritus chant (contained in the published Graduale Romanum). The ‘non nobis’ at the end of the battle was complicated by the fact that textures in the parts changed from one to up to four parts and that Walton’s version differed somewhat to other settings. The boys choir piece later in the film had no decipherable words on the original audio so I was forced to use a religious poem by St. Thomas Aquinas as the setting. This would have fitted in historically with Agincourt both at the time of the battle as well as, of course, Shakespeare’s play. Aside from other logistical difficulties in sound balance and some synchronisation issues, the performance received quite a bit of publicity as well as some favourable reviews (Telegraph). The process which had begun from a project to restore the original film to a HiDef picture (Granada Media) was also the subject of a Digital Planet documentary on the BBC World Service. 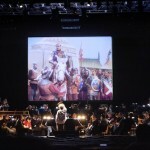 The film was also performed in Leipzig in 2012 at the Gewandhaus by the MDR Radio Orchestra conducted by Frank Strobel. It continues to bring to life Walton’s original design and, as I indicated on the radio, it is as close to sitting in on the recording session as an audience can get.